Locals and visitors alike can get caught up in the hunt for this elusive yet valuable (currently more than $1,233 per ounce) metal. The Russians first discovered gold on the Kenai Peninsula in 1849. After that, Southeast Alaska had a discovery at Sumdum Bay in 1870. Indian River near Sitka offered up gold in 1871 and, in 1872, an area near Wrangell produced gold. The Juneau area began discoveries in 1874 with the Windam Bay gold strike, then in 1880, Joe Juneau and Richard Harris had a major gold strike at Gold Creek. The gold discoveries continued north with Yakutat Beach and Lituya Bay in 1887, Circle City in 1889, Kenai Peninsula’s Sunrise gold rush in 1895 and the Hope gold strike on the south side of Turnagain Arm in 1896. Shortly thereafter, true masses began to rush to Alaska and the Klondike Gold Rush was in full force in 1898. Discoveries continued with the Fairbanks area booming in 1902 after Felix Pedro’s discovery. Across the state, gold appeared in mining operations and still today, there are miners searching the water and the land. 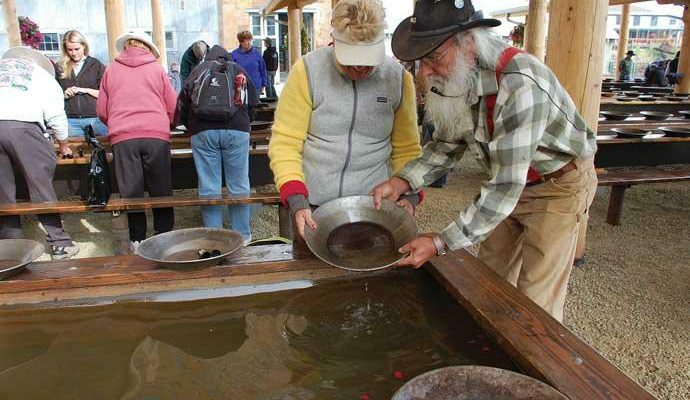 Catch gold fever while you’re here, and try your hand at panning gold either on your own (see regulations) or at a tourism location that offers gold panning. It is important to familiarize yourself with the current regulations before you begin. Panning, sluicing and suction dredging on private property, established mining claims or on Alaska Native owned lands is considered trespassing unless you have the consent of the owner. Recreational gold panning, mineral prospecting or mining using light portable field equipment (e.g. hand-operated pick, shovel, pan, earth auger or backpack power drill or auger) is allowed without mining claims in designated recreational mining areas managed by the Dept. of Natural Resources. Motorized gold panning on public lands set aside for recreational mining and panning is not allowed. This means, if you wish to do some gold panning of your own, you’ll need to do it with gold pans, or sluice and rocker boxes. Sluice boxes are available at many Alaska sporting goods stores such as Sportsman’s Warehouse (in Anchorage, Fairbanks, Wasilla and Soldotna). Panning can be a great outdoor activity, but to ensure that you have a good experience you’ll need the proper equipment. Plan on dressing in layers to prepare for changing temperatures; carry effective rain gear and waterproof boots; have insulated gloves for working in Alaska’s ice cold streams; and have plenty of bug spray on hand. There are public lands in Southcentral set aside for recreational gold panning, such as on the Kenai Peninsula, where 4 different gold producing creeks are known to provide “colors” or gold: Bertha Creek at Milepost S 65.4 Seward Highway; Sixmile Creek on the Hope Highway; Resurrection Creek, off the Hope Highway; and Crescent Creek (Quartz Creek Road off the Sterling Highway). Petersville Recreational Mining Area on Petersville Road (turnoff at Milepost A 114.9 Parks Highway) and Caribou Creek Recreational Mining Area (access from Milepost A 106 Glenn Highway) have areas that allow for independent recreational mining. Click on their links for fact sheets on these areas. In the Interior, recreational mining is allowed in the Nome Creek Valley of White Mountains National Recreation Area. This area is accessed via 11 miles of gravel road from Milepost F 57 Steese Highway and is managed by the Bureau of Land Management. Recreational gold panning is also allowed (no mechanical devices) on the west side of Pedro Creek, directly across from the Felix Pedro Monument, at Milepost F 16.6 Steese Highway. Check with the Alaska Public Lands Center in Fairbanks. One of the easier ways to learn about gold panning and mining history in Alaska is to visit a commercial operation. They guarantee that you will find gold! In Southcentral, the Indian Valley Gold Mine at Milepost S 104 Seward Highway lets you pan and sluice for gold in their troughs or from a proven, gold-producing stream. Just a few miles away, the Crow Creek Mine off the Alyeska Highway also let’s you try your hand at some gold panning along with demonstrating gold panning techniques in the same waters that they work for gold extraction. South of here, at Milepost S 56.3, turn off on the Hope Highway to go to Hope Historical Museum, where, when he is available, it is possible to do some panning for gold with an old-time prospector. North of Anchorage, the 271-acre Independence Mine and State Historical Park (215 miles roundtrip from Anchorage) includes several restored mine buildings and old mining machinery. Alaska Pacific Consolidated Mine Co., one of the largest gold producers in the Willow Creek mining district, operated here from 1938 through 1941. Although there is no gold panning here, it is well worth a visit for the history of this area and of gold mining. In Interior Alaska, gold panning is offered at Pioneer Park in Fairbanks, which also has displays of gold mining equipment. Northeast of Fairbanks via the Steese Highway there are 2 opportunities for hands-on gold panning. At Milepost F 8.4 Steese Highway stop at Gold Daughters and learn how to pan with professional prospectors or continue on to Milepost F 9.5 Gold Dredge 8, a National Historic Site. Their tour includes a narrated train ride past Gold Dredge No. 8, plenty of Interior mining history, gold panning lessons and gold pans for sale. The turnoff for Gold Dredge 8 is at Milepost F 9.5 on the Steese Highway. The Taylor Highway provides access to the historic Fortymile gold mining district, where active gold mining is still underway. Take the Taylor Highway to Chicken, AK, and visit the Gold Panner for free goldpanning on Chicken Creek, Chicken Gold Camp for tours of the Pedro gold dredge and gold panning lessons, and Beautiful Downtown Chicken where meals are served in a gold pan and panning is adjacent the restaurant. Continue up the Taylor Highway and view current gold mining activities alongside the road in streams. These mining businesses are privately owned and should not be trespassed upon or explored. Gold continues to be found in this area and in legal panning areas, you may find some of Alaska to take home with you.